Around 66% of the population consider themselves Orthodox Christians. 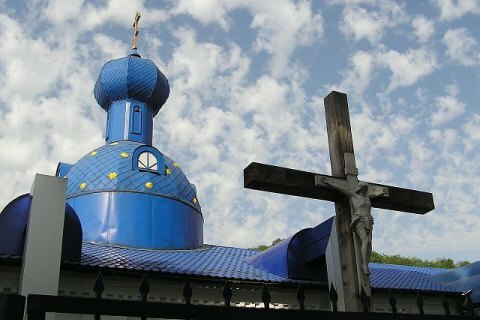 Some 28.7% of respondents in Ukraine associate themselves with the Ukrainian Orthodox Church of the Kyiv Patriarchate (UOC-KP) and only 12.8% with the Ukrainian Orthodox Church of the Moscow Patriarchate (UOC-MP), according to an opinion poll by the Razumkov Centre presented on 26 April. The share of UOC-KP followers has been increasing year to year (from 15.1% in 2010) while the share of UOC-MP followers has been decreasing (from 23.6% in 2010). Self-identification as "just Orthodox Christian" remains traditionally popular. It was mentioned by one in four respondents (23.4%). Two thirds of the population make a stable Orthodox core. This year the share of the Ukrainian Autocephalous Orthodox Church parish is the lowest, 0.3%. The record number of believers identified themselves as Greek Catholics, 9.4%. In 2013, their share was 5.7%. The share of Protestants increased to 2.2%. Muslims were not covered by the survey. The share of those who did not associate themselves with any religion turned out to be the lowest in years, 11%. This year the respondents were also asked what church they trust. According to the findings, 37.8% trust the UOC-KP, 11.7% the UOC-MP, 9.2% the Ukrainian Greek Catholic Church, 1.9% Evangelical Christian churches, 0.9% the Ukrainian Autocephalous Orthodox Church, and 0.5% the Catholic Church. One in five respondents does not trust any church. The survey was held among 2,016 respondents aged above 18 all over Ukraine, except Crimea and occupied areas of Donetsk and Luhansk regions, on 23-28 March 2018. The margin of error does not exceed 2.3%.